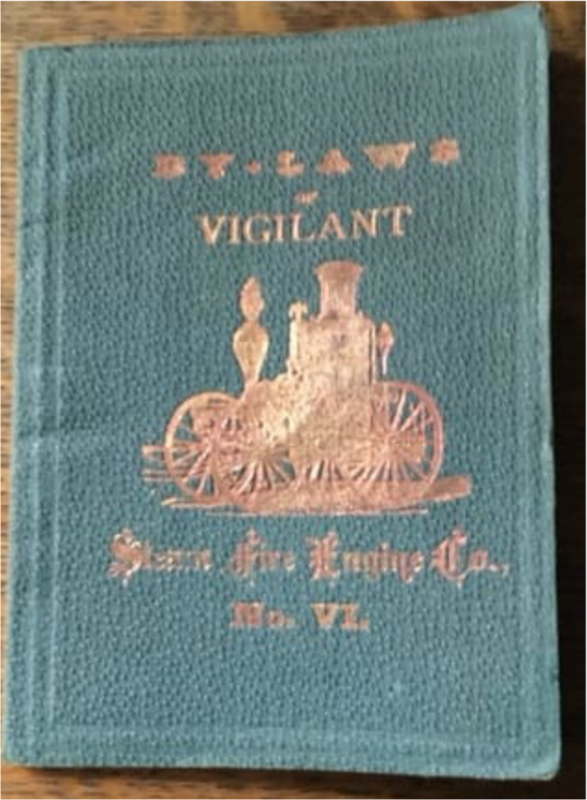 ​​This company was organized January 1st, 1867. 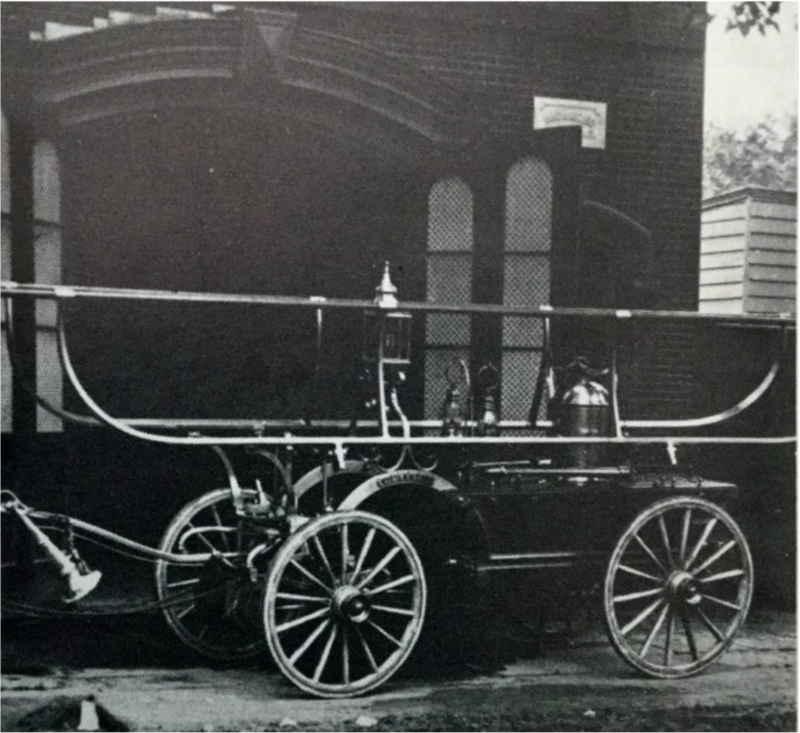 They were given the Smith piano-box hand engine last used by Passaic Engine Co. No. 1, and were housed in a one-story frame building which stood on a lot adjoining their subsequent brick house at 304 Market Street (between Straight and Madison Streets). 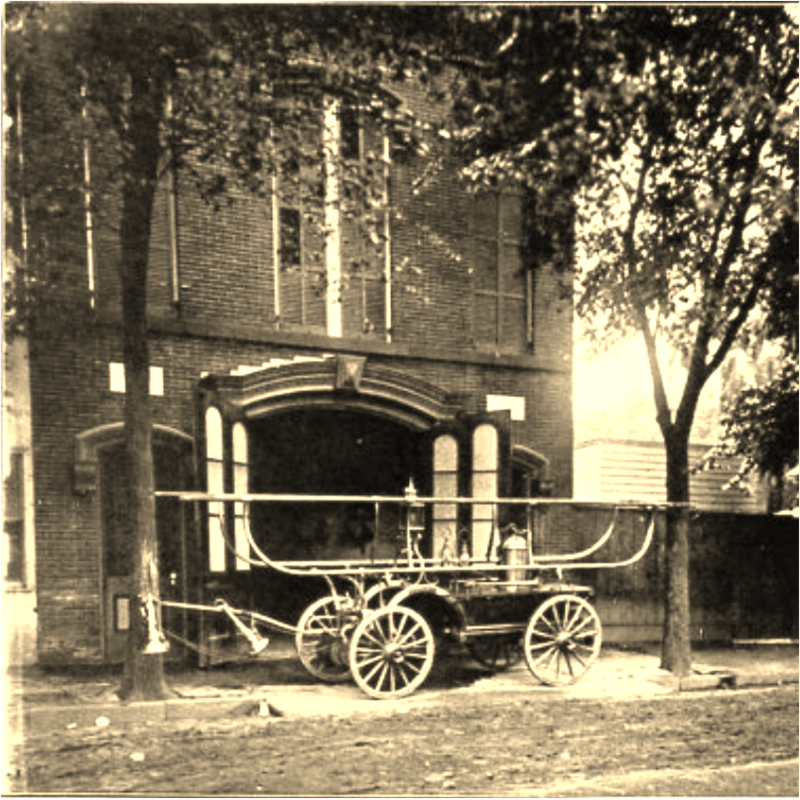 Below is shown one of the two marble plaques which were on the front of the firehouse (see photo above). 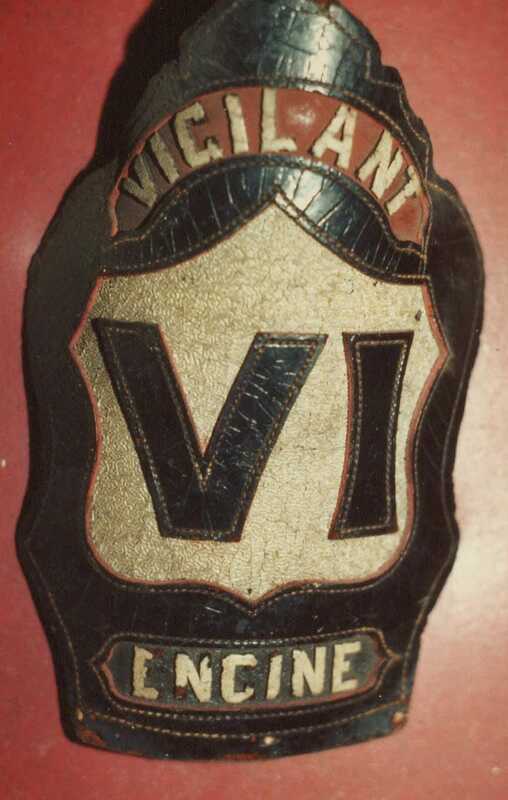 The other was carved "Vigilant 6." 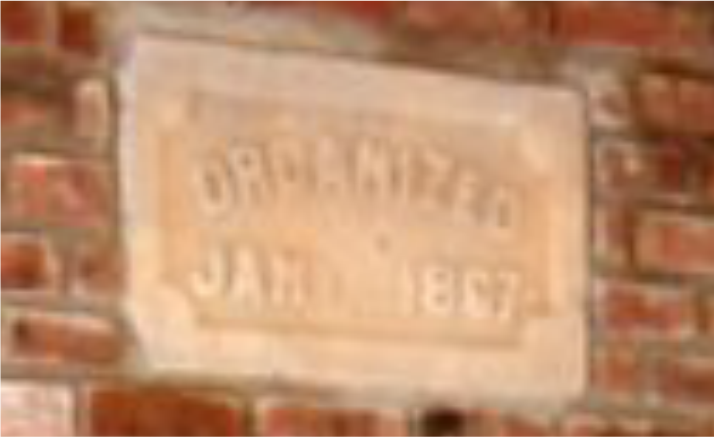 The plaque is seen below embedded in a different location (not the firehouse). 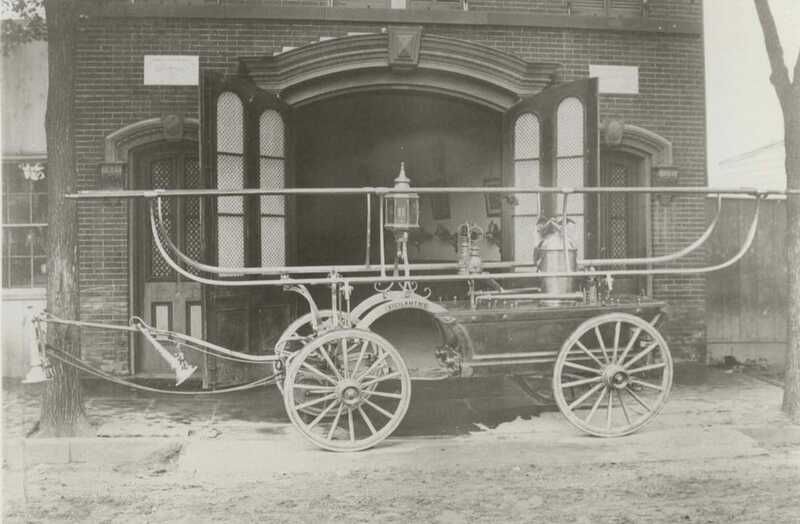 ​1871 (fall) Company was furnished with the third-class (4th size) double pump steamer, built by the Paterson Steam Fire Engine Works. 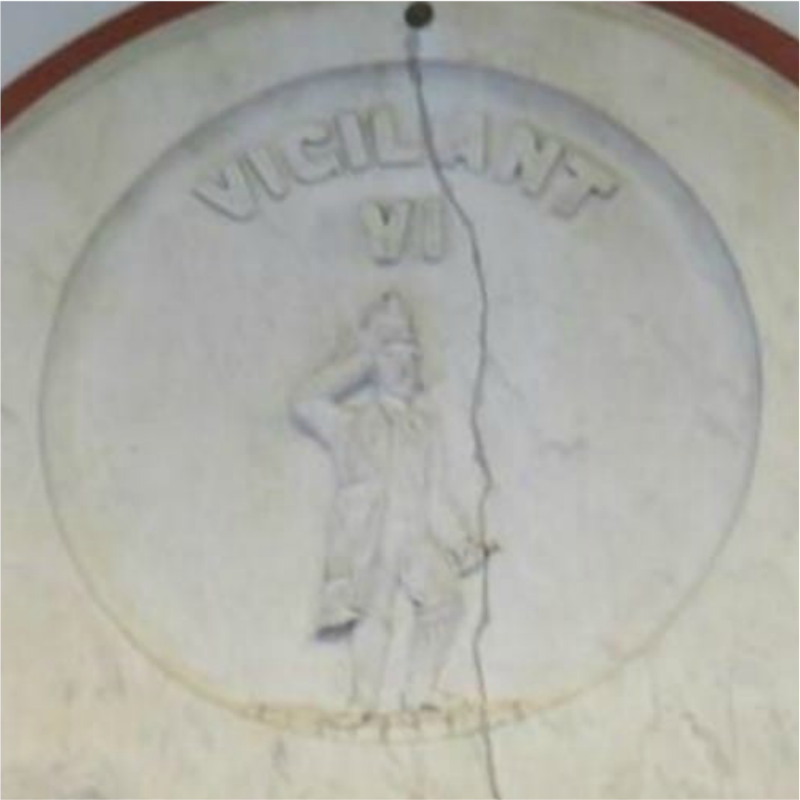 Below is a white marble slab from quarters of Vigilant 6: in center is a "vigilant"
fireman with right hand over eyes and trumpet in left arm. 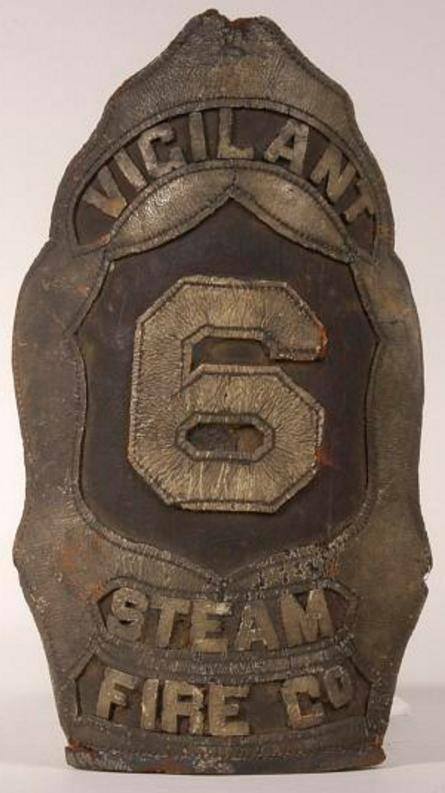 This slab is in the NJ Fireman's Museum in Boonton, NJ. 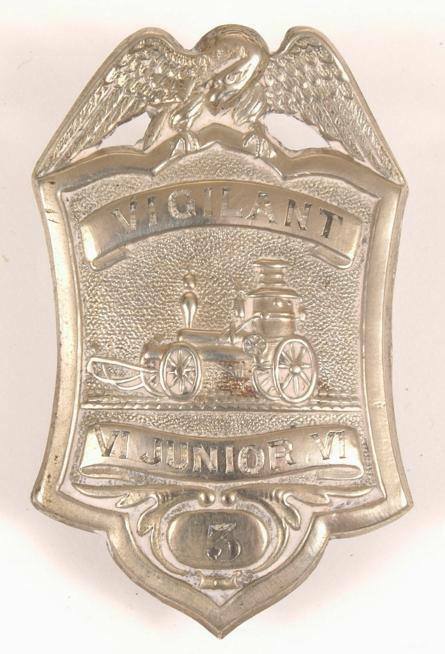 Standard Shield Shaped badge (#8) of a member of Vigilant 6. ​On the roster below #8 is fireman John Gillmore. Engineer, ALLISON ROSWELL Assistant Engineer, ALEX. THOMS. 1 Leonard Garrison. ..... .Machinist.. ........ .293 Market street. 2 Abraham Doremus. .. ... " "............. ..293 Market street. 4 Wiliam F. Miller........ Speculator .........107 Willis street. 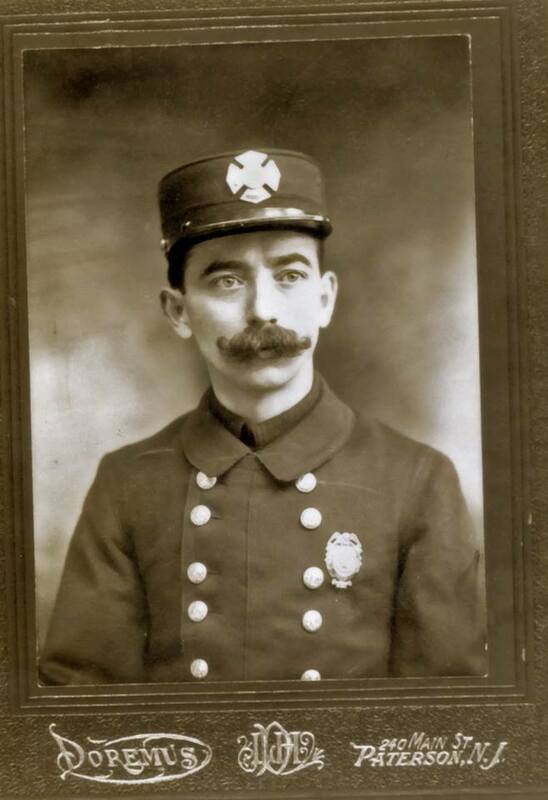 5 John F. Babcock. ... .. . .Machmist.. .......24 Morton street. 8 John Gillmore... ...... .Silk Weaver. .......63 First street. 11 John Nichols .......... Lather.. ............19 Vine street. 18 John Frolich.. .............." " ......... Cor. Peach & Plum. 23 William J. Wooley.... ..Musician. .........34 Railroad avenue. 27 Charles Titus.. .. .. . .. .. .Moulder ........... Albion avenue. 35 James Arnot............ Tinsmith. .......... 313 Market street. 36 William Golding. . . ... .Machinist.. ........16 Dickinson street. 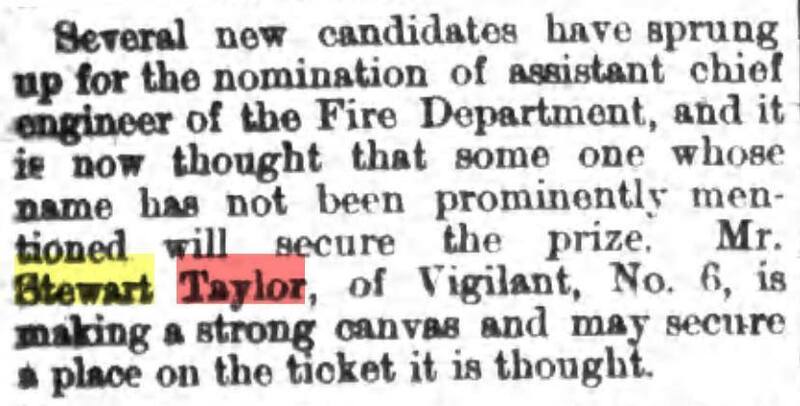 39 Charles Taylor................... " " ....... 4 1/2 Ramapo avenue. 40 Harry Brunette......... .Dyer. ............. .294 Market street. 41 James Hugginson. .... Machinist.... ..... 282 Straight street. 42 Henry Bush.. ......... .Carpenter..........14 Godwin street. 43 Terhune Demarest. .... .Silk Weaver. .......70 Willis street. 44 James Hussey. ... ..... .Baker. .............20 Willis street. 45 John Edge. ........... .Moulder.. ....... ...301 Market street. 47 John Shannon. ........ .Shoemaker ....... .394 Market street. 48 James Roberts.......... Silk Weaver. . . . . . 44 Pearl street. 49 Benjamin Hilton Jr.. . . . .Moulder.. ......... .45 Morton street. 50 James Carroll.. ......... Liquor Dealer. ..... 289 Market street. 51 Amos Edson ........... Silk Weaver. .......68 Spring street. 52 Ernest Burton.......... Letter Carrier. ... .. William street. 53 John Dreeland. ........ .Laborer. ...........93 Beech street. 54 William Slater. ........ .File Cutter. ........14 Broom street. 55 E. J. Webb............. Agent. ............. 281 Straight street. 56 Thomas Wild. ......... .Liquor Dealer. . . .. .302 Market street. 57 Albert Whowell.. ....... .Machinist. ......... 125 Clay street. 60 James Raney. ........ . Silk Weaver. .......26 Lewis street. 61 William Smith. ......... Boiler Maker. . . . . . . 286 Straight street. 62 Alexander Thoms.. . .. .. .Machinist. ........ 33 Jackson street. 72 Marcus Curley. ......... Weaver ... ........ 317 Straight street. 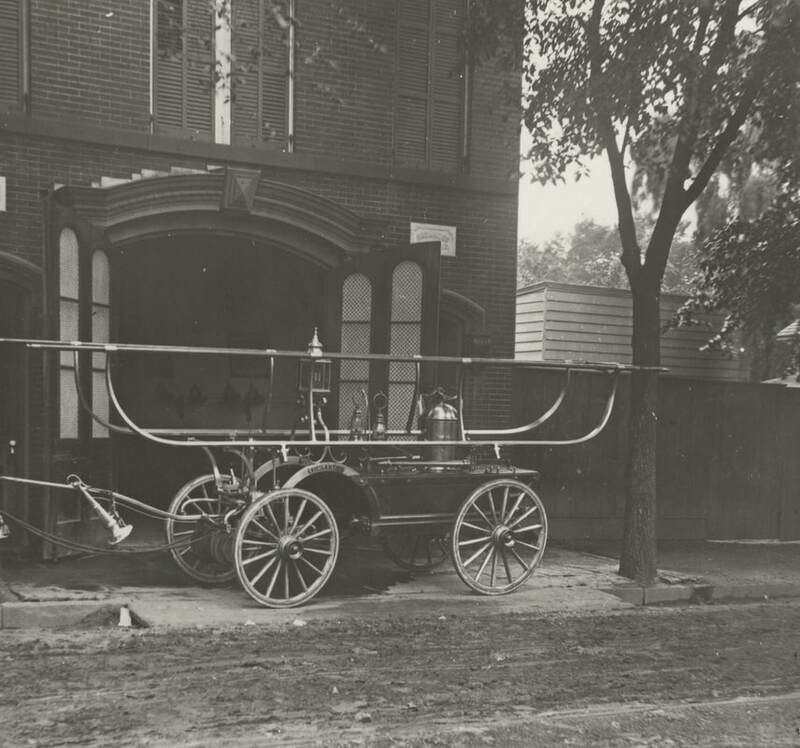 ​1887 (winter): Company received a Clapp & Jones engine. 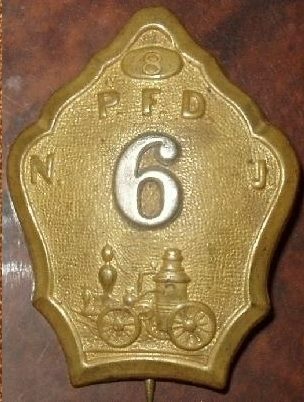 This apparatus was usurped by the Paid Paterson Fire Department in 1890 and was renamed as Engine Company 6.